Not much is known about the tragic death of a poor chicken found on the grounds of the Farsley Cricket Club in Leeds, United Kingdom earlier this month. What is known is that the fowl suffered excruciating pain before it was finally, mercifully, put to sleep. The chicken was found on August 18 with severe burns covering nearly all of its body. Its normally white feathers had been charred black, some had even melted off, leaving large swaths of her bare skin exposed to the elements. There, huddled against the wall the chicken sat unable to move and in what could only have been excruciating pain. Why people decide to inflict such cruelty on another living being is often unclear, but there is clarity about one thing — animal abuse cannot be ignored and abusers must face justice. 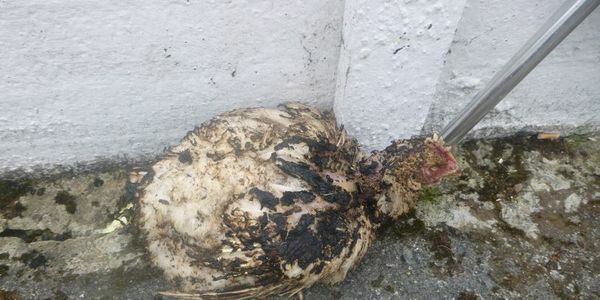 Please take the time to sign this petition and demand justice for the torched chicken of Farsley. Tell the West Yorkshire Police to continue to search for the abuser and bring them to justice.